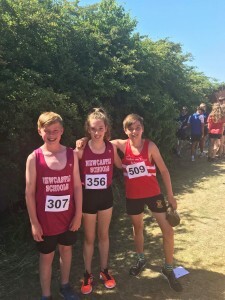 Three of our juniors represented their district schools at the Staffordshire Schools U/13-14 Championships held at Tamwoth on Wednesday 27th June. Please note positions are correct but times are not eligible for thepowerof10.info as their was a lack of qualified timekeepers. 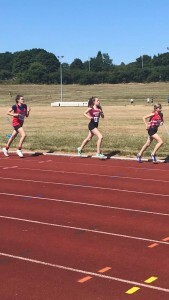 Lucy Brownsword represented Newcastle Schools and competed in the U/13 Girls 1500m, finishing 12th in 6:04.0 mins. 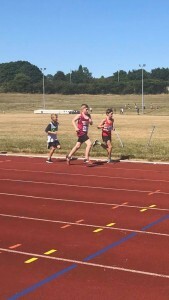 Charlie Ranford ( Newcastle Schools) and Joe Stevens (Stoke Schools) both competed in the U/13 Boys 1500m with Charlie finishing 12th (5:43.3 mins) and Joe Finishing 15th (5:46.2 mins). Congratulations to Lucy, Charlie and Joe. Thanks to Jon Ranford for the photos.